A sunny day in the van Eck forest. Photo by Heidi Walters. Fred Marinus van Eck loved trees. The New York City investment banker owned thousands of acres of them all over the world. And it wasn't only their cool, fragrant, fern-swept, critter-harboring selves that enchanted him, but their potential — he loved working trees, timber. And one patch he was particularly fond of was the nearly 2,100-acre redwood forest he bought in 1969 on the Pacific Northwest coast, sandwiched between tiny Fieldbrook and now-sprawling McKinleyville. Once a year, van Eck would fly out from New York to wander through his California woods. They'd been hammered in the past — heavily logged in the 1800s, and again in the 1950s. Now van Eck was watching the property grow into what he hoped would be a different sort of working forest: one with a redwood-dominant mix of species and different-aged trees supporting wildlife while growing big timber. Sylvia Garlick, a McKinleyville real estate agent who befriended the rather shy van Eck, often accompanied him on his walks. "I always remember one time in particular," said Garlick. "We were walking on the property and he had a pair of clippers, and he would stop and snip the redwoods — the little ones, trees about a foot tall. He was pruning." Jim Able, who managed this forest for van Eck for 30 years, says his annual working stroll with van Eck was like "somebody reviewing your master's thesis. He asked you everything, from weather patterns to forest types." He'd check on individual trees and quiz Able about their readiness for harvest. Van Eck's scrutiny was but a foreshadowing of what was to come. Today the climate change community is eyeballing this sky-reaching swatch of dark green, slowly reclaiming time just miles from the Pacific Ocean, with particular intensity. It could be a bright new hope on the global warming front: the working forest/carbon credit grocery store. Already the celebs have come shopping: Earlier this year Gov. Arnold Schwarzenegger bought some carbon credits from the van Eck to offset some of the considerable carbon dioxide generated by his traveling. Nancy Pelosi, Fabian Núñez and California Environmental Protection Agency Secretary Linda Adams likewise bought some van Eck cred. And big utilities like PG&E are talking about using forest credits. Mr. van Eck, if he were alive (he died in 2000 at 82), might be amazed. Perhaps even pleased. But his old forester, Jim Able, is frankly a little perplexed. The van Eck forest is now managed under a conservation easement by the Pacific Forest Trust for the Fred M. van Eck Forest Foundation. (The foundation was formed when van Eck willed his forest, under condition it remain a forest, and a $21 million endowment to Purdue University to support one of its forestry research programs.) The PFT let go of Able's firm and hired a new forestry management team last year. They're good foresters, says Able, but he questions the PFT's claim that the van Eck now will remove 500,000 tons more of CO2 from the atmosphere — tons that count as credits that can be sold — over the next 100 years (and produce 170 million board feet). What are they doing out there that's different from Able's light-harvest, selective approach? How will they sequester more carbon? The answer requires some mental gymnastics. The van Eck is the test site for California's newly adopted "forest protocols" that a landowner who registers a forest with the California Climate Action Registry must follow. The registry, opened in 2004, is where entities declare publicly what they're doing to reduce greenhouse gas emissions — in a forest's case, carbon dioxide. The protocols are the accounting standards by which the forest's "additionality" — extra carbon stored — is calculated. To register, a forest must have a conservation easement, which conserves it in perpetuity. Then the forest owner commits to inventorying the trees, calculating how much carbon they can store, and harvesting them within defined limits aimed at growing them bigger over a longer period of time. And the forest has to provide "co-benefits" — local economic value, clean air and water, native forest habitat. The owner reports emissions reductions yearly to the registry, and those are verified by an independent forester as well as one from CCAR. The van Eck was the first forest registered with CCAR, and its declared emissions reductions are now being scrutinized. The forest protocols legitimize the use of managed forests as a climate change strategy, says Andrea Tuttle, former director of the California Department of Forestry and Fire Protection, who is active in developing California's forest protocols. She's giving a presentation on the van Eck Forest and California's new forestry protocols this week in Bali during Forest Day, a parallel session to the U.N.'s climate change conference. The strategy could be groundbreaking. Forests store more than half the world's terrestrial carbon, and cover a third of the United States, says Tuttle. "They are a carbon sink through photosynthesis but become an emission when forests are lost and the land converted to other uses," she wrote in a fact sheet on the protocols. Deforestation accounts for nearly half the extra CO2 emitted into the atmosphere, second only to the burning of fossil fuels. But until now managed forests have been considered too difficult to assess for their carbon storage, Tuttle says. Even under Kyoto, with an established carbon-trade market, the only acceptable forest-generated carbon credits have been from the reforestation of agriculture lands or from new plantations on previously unforested land. California's protocols could change that view and boost the United States' own fledgling market, says Tuttle. "There has to be confidence that that ton is being stored," she said. More important for California is that the protocols could help the state meet the newly mandated goal to cut its emissions back to 1990 levels by 2020. But what has actually changed on the van Eck forest so it stores more carbon? Well, it's a matter of semantics, partly: Under the forest protocols, a forest project's extra carbon storage is calculated against a baseline of "an aggressive clear-cut scenario," said Tuttle, referred to as "business as usual" management permitted by state, federal and local laws. So they're managing the forest to store more carbon than it would have based on what could have legally happened — not necessarily on what actually was happening — as well as based on what carbon might be stored in the future based on the new management. The key point, says Connie Best, managing director of the PFT, is the forest remains standing forever, and the management is locked in. Tuttle says the required easement, which comes with tax breaks, plus the ability to sell verified credits, offer incentive to keep forests alive. "The majority of non-industrial owners in California are already managing their forests less intensively," she said. This means they're selling less timber. "I was looking for new ways to help keep non-industrial owners on the land ... to find a new revenue stream." But some wonder whether locking the forest into a particular management strategy at this point in time might preclude foresters from adapting to the latest and best science. Jim Able, like some other foresters, has trouble with the whole "forever" thing — the conservation easement. "They're trying to describe a future forest," he said. "You can't take a forest and set up rules and regulations for it and say it's forever. You need to have the ability to change things, as you learn more. For example, fish need structure in the stream — logs, rocks. Well, in the '60s and '70s, the state Fish and Game department came along with this idea that some logs were blocking the way of fish. So they took all the logs out of the streams. And so now there's this great lack of structure in the streams. So, now they know better." Neil Sampson, of Virginia, who consults for the National Carbon Offset Coalition, agrees it's hard to predict what'll happen 100 years down the road. 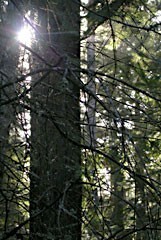 "Our knowledge of how forests grow is based on history," Sampson said. "The next 100 years, with a different climate, won't look anything like the last 100 years. And that makes me very nervous about long-term projections." But he says there's no magic bullet. "And, you know, we are going to have to transfer to a new energy system. It's not going to happen overnight. Forestry's something we can do now; it's a bridge." Heidi Walters is a staff writer forThe North Coast Journal.